Cannabis grow ops continue to expand as the full effects of the 2018 signing of the US Farm Bill last December impact positively on the industry and particularly in states such as Colorado which has had a long history of involvement. This case study concerns 4,500 square feet of older industrial space in Denver that has recently been re-purposed as an interior cannabis grow op. Grow op owners and operating managements take a long term view of their industry as it pertains to the regulatory environment governing how human consumable products are produced. 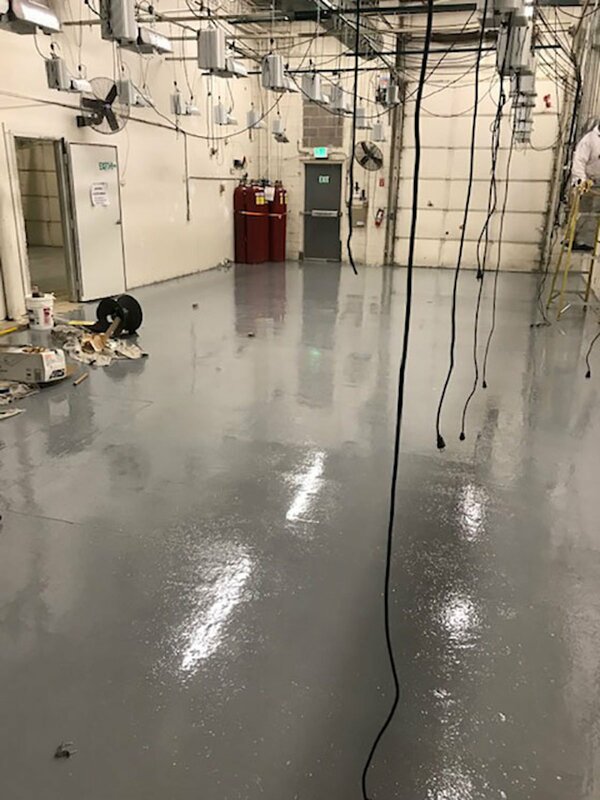 Their problem has been how to upgrade, as in this case, older industrial sites that have floors that have been used for different industrial applications. They foresee the US Department of Agriculture weighing in at some point mandating that all surfaces should be kept at a high state of hygiene whereby human consumables can be safely made without contamination. Many cleaning solutions are particularly harsh and can radically shorten the life of protective coatings. Furthermore, forklifts, foot traffic and packaging handling can quickly cause cracking in many conventional epoxy coatings which can then allow dust and cleaning fluids to seep down. There is also the concerns over VOC emissions and solvent use. There is high demand today for the elimination of both with no compromise on performance. Castagra’s Ecodur is a bioplastic that is truly zero VOC. It is completely non-toxic and has adhesion levels that far surpass the competition, making it ideal for concrete flooring. Ecodur is made from renewable castor oil and a soft rock called gypsum that occurs in many parts of the US. The combination of the two results in a polymer that retains a degree of flexibility for shock absorption, and, uniquely, original flooring surfaces can be readily repaired as new coats re-bond to old ones. Ecodur has a proven record covering the past 25 years where it has not only demonstrated its chemical and UV resistance, but also its durability in heavy industrial use in frac production water and oil tanks, water and wastewater treatment facilities and public parking garages, as well as residential ones. The floor had been swept clean and a number of cracks were filled as the self-levelling Ecodur 201M was manually applied. Ecodur’s viscosity allows it to seep deep into cracks, permanently sealing them. The average depth of the coating was a minimum of 30 mils. It became tack free in about 30 minutes and was declared fully cured at the 24 hour inspection. At that point the production room was released to the owner as being ready for its intended use.